Pictured are some fourth grade students presenting the money to three area Red Cross Volunteers. 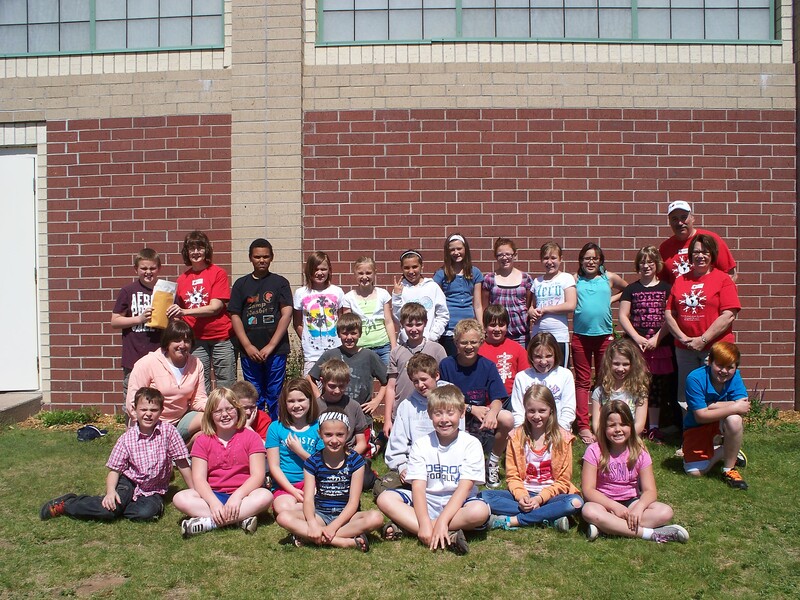 Students at Woodland Elementary, in Kingsford, MI, recently did a “Walk for Tornado Victims“. Students sought pledges from friends and family to support them in the walk. Students and Staff at Woodland walked two miles on Friday. May 11th. The students raised $2564 for the Red Cross. The Red Cross will target this money for victims from the recent tornadoes in Tornado Alley. To support Wisconsin’s, and the Michigan border communities, relief efforts American Red Cross Chapters throughout Wisconsin today received 11 Briggs & Stratton (NYSE: BGG) generators and 13 pressure washers as part of a large donation to help the organization better prepare for and respond to disasters and emergencies in communities throughout the country. The donation by Briggs & Stratton includes 847 generators and 483 pressure washers to Red Cross chapters in disaster-prone locations across the United States and Puerto Rico. The generators can supply power at disaster shelters and service centers during relief operations and even power devices within our chapter’s offices. The pressure washers will ensure a high level of cleanliness for washing cots, food containers and other cleaning projects. “When disasters strike, the Red Cross is there helping neighbors and communities, and Briggs & Stratton is proud to be a part of that critical response,” said Todd Teske, Chairman, President & CEO of Briggs & Stratton Corporation. Briggs & Stratton delivered the generators and pressure washers in advance of the 2012 Atlantic hurricane season to coastal regions as well as areas prone to spring tornadoes. Throughout Wisconsin’s Chapters, the Red Cross responded to 972 disasters last year including multiple tornadoes, winter storms, floods and hundreds of residential fires. The first shipments will go to Red Cross chapters in Alabama, Arkansas, Connecticut, Delaware, Florida, Georgia, Louisiana, Maine, Maryland, Massachusetts, Mississippi, New Hampshire, New Jersey, New York, North Carolina, Pennsylvania, South Carolina, Texas, Vermont, Virginia, Wisconsin (home to Briggs & Stratton) and Puerto Rico. Distribution of all units to Red Cross locations should be completed by the fall. 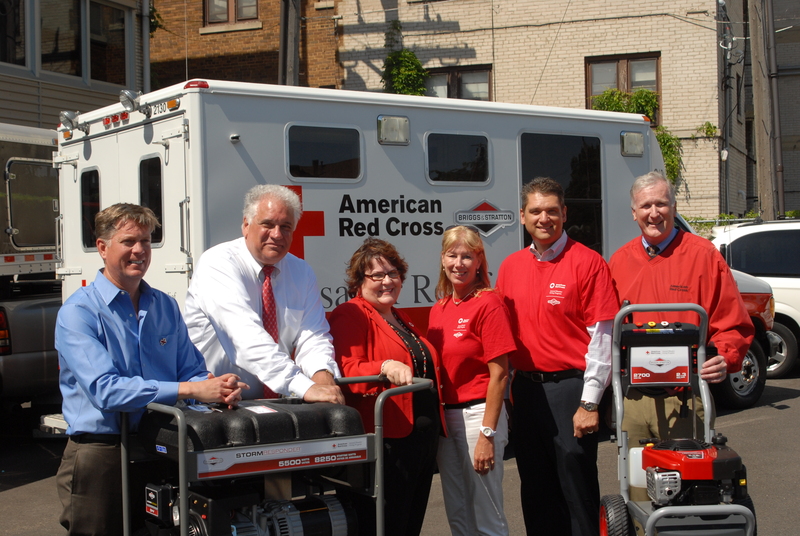 Through the donation of this equipment, Briggs & Stratton joins other corporate members in the Annual Disaster Giving Program, which enables the Red Cross to respond immediately to the needs of individuals and families impacted by disaster by helping build a reliable funding base for disaster relief services. Briggs & Stratton Corporation, headquartered in Milwaukee, Wisconsin, is the world’s largest producer of gasoline engines for outdoor power equipment. Its wholly owned subsidiary Briggs & Stratton Power Products Group LLC is North America’s number one manufacturer of portable generators and pressure washers, and is a leading designer, manufacturer and marketer of standby generators, along with lawn and garden and turf care through its Simplicity®, Snapper®, Ferris® and Murray® brands. Briggs & Stratton products are designed, manufactured, marketed and serviced in over 100 countries on six continents. Every day men and women are apart from their families in order to serve their country. They are missing graduations, births, holidays and other important family events. They worry about whether someone is sick, just as the families worry about whether troops will make it home. It only seems fair that we honor our service members with National Military Appreciation Month during May. The American Red Cross has an entire service line dedicated to serving the Armed Forces. We serve 24 million veterans, 1.4 million active duty members, 1.2 million National Guard and Reservists, and all of their family members. Providing emergency communications between military members and their families. Supporting hospital outreach and veterans programs. Providing services and programs for deployed service members and their families. Supporting families coping with the stress of deployments. Leaving for a deployment is overwhelming for everyone. In 2009, the American Red Cross reached 1.2 million people through “Get to Know Us Before You Need Us” briefings to help increase awareness of our services before military members left. A number of events can happen during a deployment. The Red Cross provides emergency communications 24/7, as well as immediate financial assistance in the case of an emergency. Red Cross volunteers assist wounded troops in military hospitals and on the front lines through volunteers on military installations around the world, including places such as Afghanistan, Iraq and Kuwait. The American Red Cross is here for military members and their families before, during, and after a deployment. Many veterans coming home face problems of depression, post-traumatic stress disorder, traumatic brain injuries, and thoughts of suicide. Hundreds of thousands of service members return from deployment with these injuries; unfortunately, less than one percent actually get treated. If a service member you know needs Red Cross assistance, visit www.redcross.org or call 800-REDCROSS or 800-733-2767. Memorial Day weekend is just ahead and for many it may mean taking to the highway for a quick vacation, breaking out the grill for some outdoor cooking, or taking that first dip in the pool. The American Red Cross offers some safety tips to help everyone have a great weekend. DRIVE SAFELY With many people traveling over the holiday weekend, it’s more important than ever to drive safely. People should be well rested and alert, use their seat belts, observe speed limits and follow the rules of the road. If anyone plans on drinking alcohol, they should designate a driver who won’t be drinking. Drivers should give full attention to the road. Avoid distractions such as cell phones. Leave ample room when behind other vehicles. Make frequent stops when traveling long distances. Clean the vehicle’s lights and windows, especially at night. Turn the vehicle’s headlights on as dusk approaches, or during inclement weather. Use high beams on rural roads unless approaching or following a vehicle. Always supervise a grill when in use, and make sure everyone, including pets, stays away from the grill. Use the long-handled tools especially made for cooking on the grill. WATER SAFETY Learning to swim is one of the best steps someone can take to be comfortable and safe around water. People can contact their local aquatic facilities to get information about Red Cross swimming classes. Home Pool Essentials (homepoolessentials.org) is an online safety course for pool and hot tub owners. Swim only in designated areas supervised by lifeguards. Always swim with a buddy; do not allow anyone to swim alone. Prevent unsupervised access to the water. Install and use barriers around your home pool or hot tub. Maintain constant supervision. Always stay within arm’s reach of young children even when lifeguards are present. Know what to do in an emergency. If a child is missing, check the water first. Know how and when to call 9-1-1 or the local emergency number. Have appropriate rescue equipment, a phone, life jackets and a first aid kit near the pool. For full information on how to be prepared and to help stay safe this summer, visit redcross.org. The Northeast Wisconsin Chapter serves 20 counties with a mission to prevent, prepare for and respond to disasters. To learn more about local Red Cross programs, volunteer opportunities, and how you can help, contact the Chapter headquarters at 920-231-3590 or visit www.NEWRedCross.org. Find us on facebook.com/newredcross, twitter.com/newredcross, the local blog is newredcrossblog.org and Chapter photos are at flickr.com/photos/newredcross. NIAGARA, Wis. – Marinette County officials have released information in regards to a structure fire at the former Niagara mill. A 9-1-1 call from a worker at the former mill reporting that the structure was on fire was received by Marinette County Dispatch at 8:48 a.m. today. Niagara Fire Department was dispatched. Mutual aid was requested almost immediately from Aurora Fire Department, followed by Breitung Township Fire, Beecher-Dunbar-Pembine Fire and Florence Fire Department. Niagara Police Department provided traffic control and scene security. All workers were safely evacuated from the plant and no injuries were reported, according to Marinette County Emergency Management officials. The property is owned by Niagara Development. The buildings on the property are owned by American Iron & Metal (AIM), Macedonia, Ohio. Sub-contractors were conducting demolition work, cutting a section of roof on the east end of the mill. The roof caught fire and spread quickly throughout the east end. Niagara Fire Chief Shawn Brown said the fire was well under control by 12:30 p.m.
American Red Cross NE Wisconsin Region sent a team to provide food and water for responders. Other agencies responding were Niagara Area Emergency Unit, Marinette County Sheriff Department and Marinette County Emergency Management. The Annual 7th & 8th grade Spring Dance was recently held at St. Joe’s Parish Hall in Wautoma. G.L.A.D. (God Loves All Denominations) organizes two dances in the fall and two dances in the spring. A fee is charged and all the money raised is given to a charity that will benefit residents in Waushara County. The money raised from this most recent dance is being given to the local American Red Cross to be used for Adult Comfort Kits. Containing personal hygiene items such as soap, washcloth, shaver, toothbrush, and toothpaste; these kits are given to adults after disasters such as residential fires, storms, floods, etc. The American Red Cross wishes to especially thank Nancy Reilly, DJ Sonny and all the adult chaperones.